Visiting Antelope Canyon X, you’ll witness the same soaring walls and windy labyrinth paths as the popular Upper and Lower Antelope Canyon, but with one key difference – far fewer crowds. Antelope Canyon tours in Page, Arizona, have soared in popularity in recent years, thanks in part to stunning images circulating the internet and social sphere of the smooth reddish-orange rock walls and sunbeams shooting down from ceiling crevices hundreds of feet above. It’s such an alluring sight, that a photo of Antelope Canyon once sold for $6.5 million dollars. The sandstone slot canyon is on the Navajo Nation land of northern Arizona, running east of Page toward Antelope Creek, which connects to Lake Powell on the border of Utah. Most visitors join guided tours at one of two well-known spots – Upper Antelope Canyon, with an easily accessible, ground-level entrance, and Lower Antelope Canyon, which requires climbing down metal stairways. While both offer incredible experiences for travelers and photographers alike, their popularity means that you’ll often be sharing the narrow passageways with dozens of other people in multiple tour groups. If you’d rather not bump elbows with strangers, or have them show up in all your pictures, a quieter alternative exists just a couple of miles down the road. Antelope Canyon X by Taadidiin Tours operates small-group excursions into a different section of the same canyon, and since they are the only tour provider here, you don’t have to worry about overcrowding and can enjoy a more serene visit to the natural wonder. We visited the canyon in late April at the most popular time of day (late morning) to see how it measured up to the photos we’ve seen online. Read on for tips for visiting Antelope Canyon X and why we think this is the best Antelope Canyon tour you can take. We arrived 30 minutes early for our reservation time as requested, and after paying the fee and signing in, we waited for a few more people to show up. There were about a dozen people booked for the 11 a.m. tour, and we all loaded up in two 4WD vehicles to make the 3-mile commute to the mouth of the canyon. Once there, we hiked down a sandy hill to the first of two slots we would enter. The previous tour of about the same size was wrapping up as we began with our guide – the only time it felt ever so slightly crowded. We decided to hang back from the others a little to get a few photos without people in them, which was easy to do with such a small group. After taking turns admiring the different corridors and rooms in the first slot canyon we entered, we proceeded to follow our guide a short walk away to the second one, where we finally got to see the X opening at the ceiling that the site is named for. Both canyons have the curvy, winding passageways often seen in photos of Lower and Upper Antelope Canyon, smoothed by erosion but with a brushed texture on the walls. It was a little early in the year to see the sunbeams that shoot down from above around the summer solstice, but some light snuck in around midday to make shapes on the walls and show off all the different shades of limestone rock. While our guide accompanied the group the whole time, we never felt rushed and were able to linger wherever we wanted to take lots of pictures or just admire the scenery. Staying within earshot proved valuable though, as she pointed out several features to us that we may have missed (like openings in the ceiling that form interesting shapes) and helped everyone get the creative photos she knew we’d want. The tour lasted about 90 minutes, including the car rides, but the end was very loose, as our guide let us wander around the first canyon again on our own after we walked back to the start. The only negative part of the whole thing – the walk back up the sand hill to the car. It’s not far by any means, but trekking through sand is hard work, and we were thankful for the employee watering it down in spots to help us climb our way out. At the end, you'll ride back to the entrance and be on your way with some amazing photos to look back on. Aside from the obvious benefits of a small group experience, like the ability to get more photos and not feeling crowded and rushed, we noticed a number of small touches that really put the Antelope Canyon X experience over the edge. First, they take care of you. From a cooler of waters at the bottom of the hill to an employee stationed to take our picture, all of our needs and wants were met. Even though we hung back from our group a couple of times, our guide made sure that we didn’t miss anything she pointed out, even leading us back into the first canyon to point out a photo spot we had missed her mentioning the first time. They also knew exactly what pictures we would want before we even did. When we started the tour, our guide told us what settings we should switch our phones to for the best results and along the way pointed out features we should snap. She stopped in one spot to pour sand over a ledge and let us all take turns posing with it, and tossed sand in the air in another location for us to capture it swirling in a beam of light. While Antelope Canyon photo tours are available here at double the price and length, we had no problem finding backdrops for our Instagram shots and our small group was able to spread out enough that we were rarely in each other’s way. There was one photographer in the canyon when we arrived, and they made sure we stayed out of his way as much as possible, too. 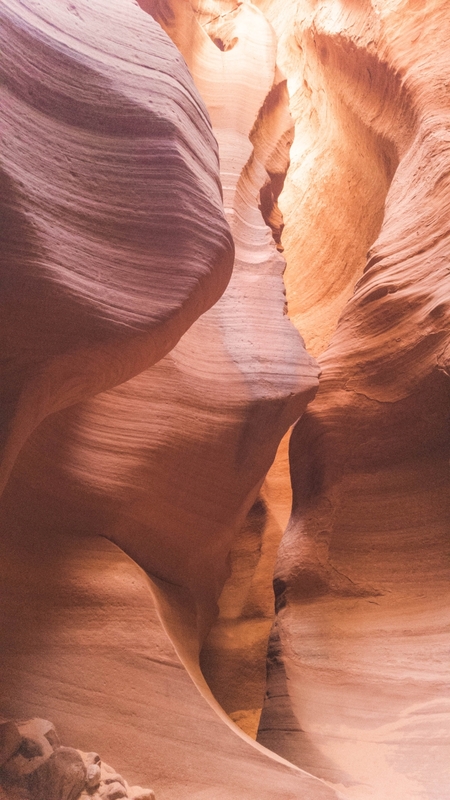 So whichever tour you book, you're sure to get plentiful crowd-free Antelope Canyon photos. This tour also is a winner because it’s a bit longer than most of the Upper and Lower Antelope Canyon tours but at a lower price. While we wrapped up at about an hour and a half, we realized afterward that we probably could have lingered for bit. Our guide let us wander around at the end without rushing us at all, and the group coming in behind us only had about four people on it. I got the vibe that they wouldn’t have minded us hanging around a little longer, as it was all very casual. 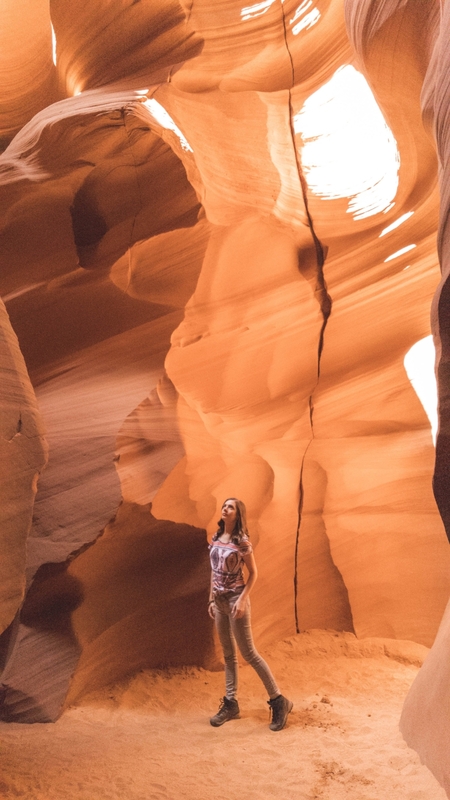 Taadidiin Tours offers three different slot canyon experiences, the first two for visiting Antelope Canyon X and the other to the lesser-known Cardiac Canyon. Hiking tours (what we did) run for 1 to 1.5 hours through two slots canyons at a guided, but relaxed, pace. Photography tours run for 2-3 hours through two slot canyons with guide available and time to photograph at your own pace. Tripods and larger bags are allowed on this tour. Cardiac Canyon tours last about 6 hours and visit a rarely traipsed canyon at the bottom of a sand dune. These adventure tours are a unique opportunity to photograph a slot canyon that’s only been seen by only a few dozen people so far. Antelope Canyon X tours meet on Highway 98 southeast of Page. After passing parking areas for other Antelope Canyon tours, you’ll see a sign that says Canyon X and a parking area with a trailer. This is on the Navajo Nation Reservation, so Navajo Nation hiking permits are required and included in your ticket price. You’ll depart from this parking area in a 4WD vehicle with a guide to the beginning of your Antelope Canyon hike. Be careful where you park. The lot is sand and gravel, and we witnessed a car get stuck in a soft spot. You can plug the following address into your GPS to pull up directions to the location: MP 308 Highway 98 #3784, Page, AZ 86040. 1. Tours follow Arizona time, which is in the Mountain Standard Time (MST) zone and does NOT observe daylight savings time. This means that during daylight savings time (generally March-early November), it’s the same time in Arizona as in Nevada and the West Coast. This may be confusing while you’re staying in Page, because the Navajo Nation in this corner of the state DOES observe daylight savings time and spring forward to Mountain Daylight Time (MDT), so your clock may freak out and change back and forth a lot. If you get confused, just call Taadidiin Tours the morning of your reservation to confirm the time. 2. Booking ahead is recommended for busy times (like holiday weekends and summer break), but you’ll likely find openings if you need to walk up instead. The midday tours, around 11 a.m., are the preferred time and will likely have the largest crowds. You can reserve a time online and pay when you arrive, and Taadidiin Tours prefers cash payments to credit cards. 3. Wear comfortable shoes for the Antelope Canyon hike, as you’ll walk up and down a sand hill, and dress appropriately for the season (winter may require a sweater in the cool canyon). 4. Arizona gets extremely hot in the summer, and sometimes the shoulder months, so wear sunscreen and drink plenty of fluids before, during and after your tour. Waters are provided at the entrance of the canyon. 5. Bathrooms consist of portable toilets near where you’re dropped off to begin your Antelope Canyon hike. Page is about a 15-minute drive away, so plan your bathroom breaks accordingly. Have you been on any of the Antelope Canyon tours?